Sebastian Vettel & Kimi Raikkonen Test Drive ALFA ROMEO Giulia Quadrifoglio! - Muscle Cars Zone! Sebastian Vettel & Kimi Raikkonen Test Drive ALFA ROMEO Giulia Quadrifoglio! Watch this amazing video footage with the drivers of Scuderia Ferrari, Sebastian Vettel & Kimi Raikkonen! They did a very cool Test Drive on the new Italian model with a beast under the hood ALFA ROMEO Giulia Quadrifoglio! As we all know Ferrari & Alfa car brands are like mother and daughter. What a family. 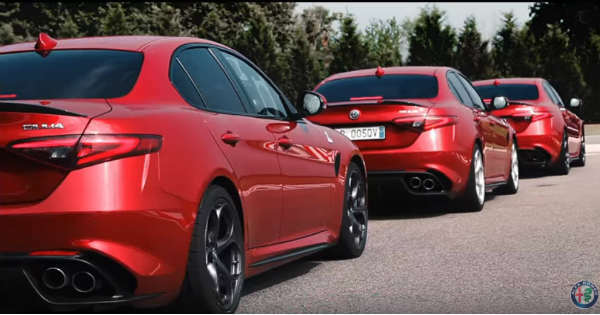 You can now enjoy the thrilling test driving of the Formula 1 drivers Kimi Raikkonen, Sebastian Vettel & the test driver of Alfa Romeo, Antonio Giovinazzi at the wheel of 3 red Giulia Quadrifoglio. So, you can now place your bets on who will be the best driver at this Alfa Romeo test drive. Sebastian Vettel, Kimi Raikkonen and Giovinazzi experienced around 1,15 G in this ALFA ROMEO Giulia Quadrifoglio during the test drive, which is quiet impressive for a car from that class. This beautiful car with sport hearth hits 0-100 in 3,9 seconds and a maximum top speed of 307 km/h or 190 mph. Check out the full video to see who wins and feel free to share this post with your friends on Facebook. Also, please share your thoughts in the comments section below and tell us what do you think about the brand new ALFA ROMEO Giulia Quadrifoglio.